Recently, the famous security software test organization AV-Comparatives (AV-C) has published the latest Evaluation Report of Mobile Security Software of 2015. 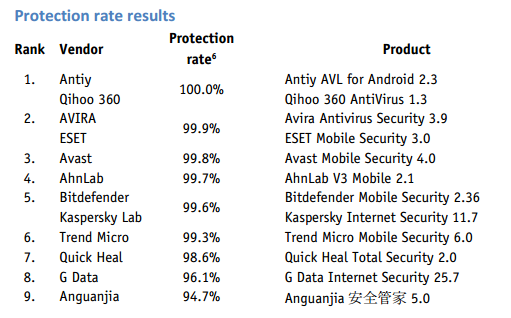 There were 12 vendors in the world took part in the comparative test, while it’s the first time for Antiy Labs to take the AV-C test, it achieved the 100% detection rate. AV-C is one of the famous certification organizations in the world’s security industry, which is operated by AV-Comparatives located in Austria. AV-Comparatives can authenticate and test the detection rate, scanning speed and false positive rate of security software. It owns “The Dynamic Test of Complete Product” project exclusively. It continuously tests the real-life protection capabilities of antivirus software on an annual basis.